First, I’m impressed with the online community that the school has built. Their integrated online platform connects forums, video lectures (both live and recorded), course materials, chat sessions for Q&A, and more, which allows every student and faculty member to meet and engage with each other. I was concerned that not going into a school would mean that I would be essentially “on my own,” but what they’ve got going on more than meets expectations. Second, I’m impressed with the format and content of the courses. Courses run for a year and four are taken simultaneously. The basic plan for every course is that there are case books (which are, as you might expect, big thick books containing highlights of the important cases relating to a particular area of law), outlines (books that walk you through the legal concepts one must understand for a particular area of law), and supplemental resources that must be read (or listened to, in some cases) over the course period. There are a few assignments to be turned in and graded for each course, and a final exam. After the first year, there is also a state exam to pass (the California “Baby Bar“), and after the fourth and final year, of course, the actual California bar exam. Given the state tests, there is no room for screwing around. If you haven’t studied enough to bring you to where a first year law student at a full-time law school would be, you’re done. Which brings me to the third point, which is also something I like: the study is very, very self-paced. The assignments are all known to you at the beginning of the course and have pretty generous deadlines, but it’s up to you to keep track of. If you’re the kind of person who can study daily when nothing is due for a couple of months, you’ll be great, but if you don’t and try to leave it all to the last minute, it will be literally impossible. With freedom comes responsibility, and at this point in my life, I appreciate not being micro-managed by professors. Would I have been able to keep on top of my law school game when I was 22? Probably not, and I suspect most of the students at NWCU are not fresh out of college. My work with the TSA is also a distinct advantage in that most of the legal terms, and many of the concepts, are already quite familiar to me. If this were all completely new, I’d have to take things a lot slower. The verdict: so far, I’m extremely happy with my decision. I’d recommend the program to anyone interested in a law degree, with the caveats that: 1) you have to press yourself forward, without hand-holding, every day for 4 years or you will fail, which may not be for everyone, and 2) if your aspiration is to work at a big law firm, they’ll probably still prefer the “big name school” — but working in a big law firm seems about as pleasant as chewing on broken glass, and there are so many people out there who need representation who, with a little business skill and creativity, you can find on your own. Happy to hear things are going well with school. Glad to hear it John. Keep up the good work. Question, how many hours per day do you dedicate to this? It takes about 2-3 hours per day. How long are the weekly classes assuming you watch live? How many briefs or homework is expected? How is it going overall now? Thanks. Hi Richard. Did you take the Baby Bar yet? How was it? What was it like for you? I was a Student at NWCULaw , I will say that this online/Distance Learning is one of the best and least expensive compare to the rest of OL/DL Law Schools. I have to say this that you have to be very serious about studying Law , I dropped out because I did not have enough time to study, now that I have a ” Lot of Free Time” I would love to continue my Law Studies but NWCULaw would never approve my Appplication again cannot Blame Them. In closing NWCULaw is a very great School. I bet they’d take you back if you explained why you couldn’t do it then and why you could now. At NWCU, you get a guided tour of what books you need to read, optional video conferences where the instructor writes a legal scenario and the students discuss it, a discussion forum with other students, and the grading of a small number of assignments and tests. You are, for the most part, on your own to either read all the stuff you have to or end up dropping out. The video conferences are not “classes” in the traditional sense. Bottom line: you’ve gotta study on your own. If you’d prefer a more classroom feel, NWCU is probably not right for you. If you like complete flexibility and have the persistence to get through all the reading (and you learn well by reading), you will love NWCU. Hi Jonathan. Thank you SO MUCH for posting this. I am suppose to be applying for NWCULaw in the upcoming months, and am excited and nervous all at the same time. I haven’t had the chance to really encounter an actual student who is is currently enrolled. You hear things from the University, as well as things online from disheartened ex-students, but not very much from students who are currently enrolled. I have a few questions for you if you wouldn’t mind. How difficult is it for someone who does well in an online school environment, but is completely new to law? Would you think they would have an extremely difficult time? How often are the video conference lectures? How often do you have to check in with your classes? If you know that you have to take 2 weeks to go out of the country at a point later in your year, are you able to do work early so that you are not behind during those two weeks? How often are exams usually? Are there usually other students who are working on what you are working on (to collaborate or study together with periodically), or is everyone basically on there own? Have you had contact with very many post graduates who might have started their own practices or got hired with firms? Are the instructors precise in showing you what to study for upcoming exams/assignments or is it very general and you have to guess what they are going to test you on? How far along are you in the process now? I’m sorry to ask so many questions. I’m just excited and nervous at the same time, and am so thankful to finally have a chance to speak with a real life current student. Thank you! pastortonybell – I am also considering applying to NWCULaw. My advice would be to call the school and request a tour of the student portal. They are very accommodating and someone from their IT department spent 45 minutes doing a screen share with me showing me everything. It was really helpful in providing a clearer picture of how things work as a student. He was also able to answer questions about how often assignments are due, exams and live lectures. I highly recommend that you do this. The other thing I would suggest is joining the NWCULaw facebook group. Most of the members are current and former students and are very happy to answer questions. KL. Thank you so much for your reply. I will definitely setup a call with them to do that, it sounds beneficial. Also, do you happen to have the link to the FB page you are referring to? I have been searching this morning on fb for a NWCULaw page, but the only one that comes up hasn’t had any posts for a few years. Thanks again! It would definitely be harder if I had no previous law background, but certainly not impossible. There are good audio lectures that you can buy that will give you a 4-10 hour comprehensive introduction to pretty much any subject in law, and that will bring you up to speed on most things. I’d also say you’d want to attend as many live classes as possible to ask as many questions as possible, and be sure to look up anything that you don’t know rather than just moving past it. Jonathan, would you add anything to your review now that’s your 6 months in? This info is all very helpful. Thank you guys. Like Pastortony I am also looking into online law schools. This one seems like a good choice based upon my research. I did one year of law school at Western State University College of Law about 10’years ago. It cost me $16,000 in tuition at the time. I had to start working full time and couldn’t attend all the classes. So this online at my own pace seems perfect for me now. I am nervous and excited too. I will fill out the applications tonight to get the ball rolling again. Hi Jonathan, hope school is going well. How can I go about finding employment after getting my JD from NWCU and passing the bar? I’m not hoping on big law of course, but who else will hire since it is non ABA accredited? I do not plan on opening my own firm either. Any suggestions how to market myself for employment if I take this path? Thanks. For me, this isn’t a part of my plan. Working in a big law firm is about as appealing to me as chewing glass. I intend to immediately represent clients on my own after graduating. Given how hard it’s been to find a lawyer to assist whenever I’ve looked for help with my advocacy, I know that good lawyers are in demand and finding clients will not be a problem. That said, if you’re looking for big firm employment, NWCU might not be right for you. Perhaps you’d be able to work it by landing a good internship and some experience in between NWCU and BigLaw. I think being in-house counsel for a company after graduating would be a very achievable goal. NWCU graduate here. I had a great experience with NWCU, but as others have said, you have to be able to be self motivated and study yourself because noone will be on top of you. I highly recommend this school for anyone considering an online law school. That being said, the vast majority of NWCU students drop out, don’t pass the baby bar, or even if they do, do not pass the bar exam. There are many reasons for this, including the kind of students that apply for such schools, but I also found that the study of law is not just about memorizing laws and facts; a big part of it is learning to “think like a lawyer” and analyzing fact situations, which is hard to pick up in an online environment. That being said, if your head is on your shoulders, keep dreaming! I passed the bar on the first try and was lucky to get a well paying job at a tiny firm with great lawyers, based on some work that I’ve done for them while I was in school. I am now finishing my second year at this firm and am very happy with the training and experience that I’ve been getting! I feel as qualified to open my own firm as anyone, and I think the clients that I interact with would agree. As I mentioned a couple of months ago on this site about starting all over again with NWCU , I think I will get over my Fears and reapply. Why I mentioned Fear is because NWCU tried to work with me but at that time I just could not focus. I want to thank all of you for your comments. I am currently looking at attending law school on line as well and NWCU is one of my top choices. I was put in contact with a graduate who was eventually admitted to the Florida Bar. This was very helpful to me in making my decision to apply. Each of you have been helpful as well. That’s good news KC! I have hope then. I’d like to eventually practice in AZ which I understand just loosened its reciprocity rules. is it possible to compete the JD in three years through Northwestern California? By state law, your study year must be at least 48 weeks when not at an ABA school, for a total of 4 study years. This means the fastest you could possibly earn your degree is in 3 years, 9 months. Hello. I’m writing this message from Japan. I have just been accepted as a first year law student at NWCU. I’m waiting for the online class account for me to get ready and I’m very excited! I’m also excited to find your blog here. I hope we can exchange information with each other. Thanks! Hello Jonathan. I’m so glad I found this post and your honest feedback. I have been unable to pass the LSAT but I know I can learn the law. I was reluctant about the on-line route because people say you can’t practice law with an on-line degree. You’ve restored my confidence and determination. Thank you. As previously mentioned I was a Student at NWCULAW and dropped out because I did not have the time and did not realized the the amount of work you have to put into studying Law. I enroll in a Paralegal Course with a Distance Learning College just to get a better understanding of Law and then reapply to NWCULAW and was accepted this past Tuesday. So I know that I am much better prepared and in closing I just want to say I have been reading a lot of the Past Baby Bar Exam. Questions and feel more comfortable in continuing my Law Studies. I was accepted back into into NWCULAW and really appreciate then giving another opportunity. I have read where a lot of people put down NWCULAW but I can tell you this , I am a 1L student and and was talking to a Georgetown Law Student about 1L and after speaking with her at length, she said Roy it seems to me from what you are saying, about Case Briefs.Quizes and Baby Bar Preparation this Online School seems to be pretty good. I submitted my first Case Briefs and was informed by my Professor that is not the way to submit Case Briefs ( Contract, Criminal and Torts Law) . How can one say that NWCULAW doesn’t try to work with you? I’m doing research to apply to this school. My only concern is passing the baby bar? Do you think it’s doable? Thank you very much for this review. I too am considering NWCU Law. I’m a vet and older student (41 yo). I look forward to applying in 2018 and can’t wait to meet other students to network and study with. My best wishes to everyone currently enrolled and on your path to JD and passing the Bar! I’m looking to get a JD and go active to get school money for an ABA accredited law school. I would love to go Navy JAG. Love your input about NWCU. I’m in the process of deciding between NWCU and St. Francis. There is a huge cost difference and therefore wondering if that relates to the quality of education. Curious what you think. anymore after 1L? Is the $75 LexisNexis library fee mandatory/useful or can I also get access another way? Hi Jimmy, sorry for the delay. I think purchasing them is mandatory. It’s a bit of a lame policy, but the total cost of attendance is so, so low that it’s hard to complain. The Lexis fee is also mandatory, and yes, it is definitely useful! When you’re an attorney, you’ll *wish* that Lexis would give you access for $75 (their non-academic rate is far higher). Hi Jon, great thanks for getting back to me on my two questions. 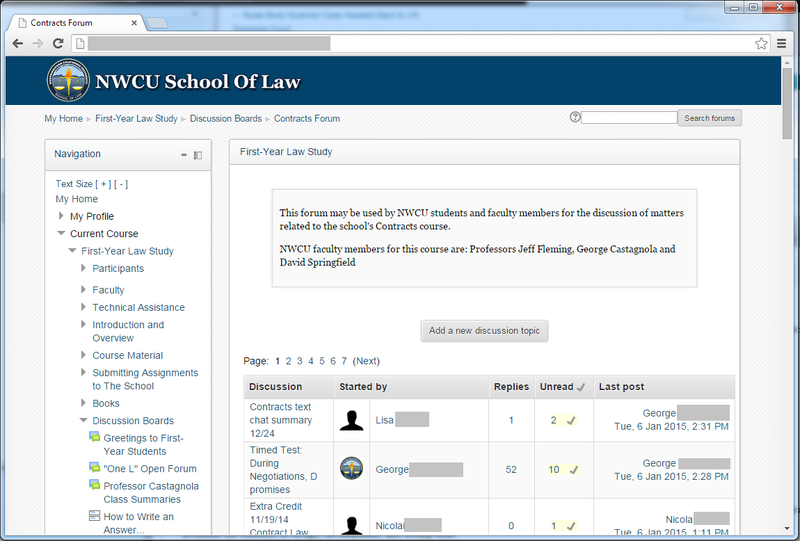 I start NWCULaw on July 22nd. Do you know where I can find/download NWCULaw specific outlines for 1L courses (Criminal, Contracts, Torts)? I don’t want to buy other commercial outlines or use outlines from other schools, just NWCULaw specific ones? Thanks for any head’s up, Jon! The commercial outline required by NWCU (either Gilbert or Emanuel) *is* the official course curriculum. You must buy these ones. A word of wisdom: just do what they tell you to do, at least for 1L. After the first year, you can figure out your own way if you must, but until then, buy and read exactly what the school says to. Okay thank you for those words of wisdom, Jonathan! Thank you all for the wonderful feedback. I will be applying tomorrow and this has been a tremendous help. Bless you all and I look forward to contributing along my journey. Hi Jon! Thanks for this great information! I was wondering if you’ve come across any students with young children or if you think the program is doable while working full time with young children. There are other students who have very busy lives, including parents and at least one who is also a medical doctor. If you have 2 hours a day, every day for 4 years, that you can dedicate to studying, you can do it. Five Year Anniversary | TSA Out of Our Pants!